A smell free home is also a sign of a healthy home. Learn how to get the dead animal smell out from our free smell removal guides. It’s a matter of your health and we do wish you well. Got Smell of Dead Animal? If rodents such as mice, rats or squirrels have invaded your home, it’s necessary to get rid of them as quickly as possible. They carry diseases, breed exponentially, and they can create an infestation in no time. Killing rodents with a poison can solve one problem but unfortunately lead to another. This happens when the poisoned rodents can’t be found after they crawl up into attics, walls and ceilings and die there. As the Dead Animals start to decay, the smell generated can be extremely unpleasant and very overwhelming. So getting the decaying smell out should be a priority, because if you don’t take action, it will start migrating everywhere and your whole home will become smelly. What Causes Dead Animal Smell? The smell from decaying Dead Animals is generated by a combination of various chemicals including sulfur dioxide, methane, benzene derivatives and long chain hydrocarbons. This cocktail of gases produces a smell that is disgusting and sickening to all except vultures! These Dead Animal smells continue to be produced as various body parts proceed to decompose completely over a 6-10 week period. The good news is that Dead Animal smell can be eliminated so you don’t have to put up with the disgusting smell and stop it from enjoying your lovely home. By utilizing our simple and informative smell removal guide, our smell experts will teach you how to get rid of smell from Dead Animals, take immediate action to rid smell, and Smell the Difference! The first step to get Dead Animal smell out is to find the source and remove it safely so the smell does not get worse. Failure to remove Dead Animals and control smell can transform a smelly home to an uninhabitable and unsafe home. As long as the Dead Animal is in your home, the smell will get worse with time as the animal decays. So it’s important to find the carcass ASAP and get rid of it to stop the odor from getting worse. To locate the Dead Animal in a wall or enclosed space, follow your nose. Flies in the room may also lead you right to the spot. You may also see maggots migrating away from the Dead Animal. Or, with a larger animal, you might find a damp spot or a stain on the wall or ceiling that will lead you to it. When you find the Dead Animal, pick it up carefully and dispose of it in a plastic bag. Be sure to wear gloves and a mask while handling the carcass and cleaning contaminated areas, as Dead Animals are carriers of a multitude of diseases. Clothing worn while handling a Dead Animal should be discarded. Don’t despair if you were not able to locate the Dead Animal as is often the case with small mice. Proceed to Step 2 to eliminate the Dead Animal smell. It will be a little more difficult but you will still prevail in the end. If you did locate and remove the Dead Animal, the unpleasant smell will still linger on for weeks if left untreated so you should also proceed to the next step to completely remove the Dead Animal smell as quickly as possible. The second step in Dead Animal smell removal is to follow the recommendations below to get the smell out using professional strength SMELLEZE™ Smell Removers that rid smell without masking it with harmful fragrances. This is a proven green deodorizer that has been used successfully for over 20 years and recommended by thousands of people all over the world. Do this by simply placing the SMELLEZE™ Reusable Dead Animal Deodorizer Pouches (only $12.99) in areas with the Dead Animal odor and smell the difference. This smell remover attracts Dead Animal smell like a strong magnet, absorbs it like a super absorbent sponge, and eliminates it without masking with harmful fragrances. Using a fan and opening doors and windows will accelerate the Dead Animal smell removal process. In addition, you can place SMELLEZE™ pouches on your return vents in your home to continuously filter out the Dead Animal smell and harmful pollutants as your air recirculates. If you have not been able to find the Dead Animal but have found the wall or enclosed space that the smell is emanating from or you’ve found the Dead Animal but it can’t be removed, take the following action. Drill 3-4” holes (about 3 feet apart) through the wall one foot above the floor and suspend SMELLEZE™ Reusable Dead Animal Deodorizer Pouches in them. Be sure to plug the holes afterwards and seal off any cracks that are allowing the Dead Animal smell to escape. Use a fan to draw fresh air into the treated enclosed area, forcing the old smelly air out. Then place the fan to blow air out of the window that it’s placed in and to draw in fresh air from another window across the room. The SMELLEZE™ Pouches can be removed once the Dead Animal smell is eliminated and holes permanently sealed. If you have Dead Animal smell on linoleum, wooden or concrete floors, get smell out by sprinkling SMELLEZE™ Eco General Purpose Deodorizer Granules (only $12.99) on it. If you have carpeting, use SMELLEZE™ Eco Carpet Deodorizer Powder (only $12.99). Leave on the floor for a few hours or overnight (longer the better) to draw the Dead Animal smell out and to eliminate it before it gets released into the air. Then simply vacuum or sweep up and discard. You can also follow the same procedure to rid Dead Animal smell from upholstery, furniture and clothing. If you have any articles that have absorbed the Dead Animal smell, remove them and let them air out in the sun as long as possible. Upholstery and clothing are very good at absorbing and retaining Dead Animal smell. Any fabrics that can be washed should be in hot water. You can also use ODOREZE™ Natural Laundry Deodorizing Additive to get rid of really stubborn smells from clothing by soaking them in it prior to washing or adding to your laundry. As mentioned earlier, Dead Animals can harbor diseases. After you remove the Dead Animal and clean up the contaminated area, it’s also important to kill and prevent airborne germs. This is simply done by replacing any light bulbs you have in your home with SANIBULB™ Air Sanitizer & Purifier CFL Bulbs. SANIBULB™ will sanitize your air by killing various microorganisms such bacteria, viruses, mold, fungi, and dust mites without the use of any harmful chemical sanitizers. As an added benefit, it will also reduce your energy consumption by 75% and save you money! Once you have completed the hard work of eliminating the Dead Animal smell, it’s important to take the proactive steps to deter rodents from coming on your property and entering your home so you never have to deal with Dead Animals and their smell again. Rodents must have adequate food and shelter in order to live and thrive. Removal of these 2 factors is the best way to prevent and control rodent problems. It is important to include both the outside and inside of your home in your sanitation efforts. Also, if you do have a rodent problem in the future, avoid using poisons to kill them and look at other alternatives. Be cautious around Dead Animals, as they may be carrying harmful diseases and attract insects that spread those diseases to your family. Always wear gloves and a mask when handling Dead Animals. Avoid masking Dead Animal smell with fragrances. Covering-up Dead Animal smells never really eliminates the odor, it just overwhelms your nose into detecting the fragrance instead. The smell will return when the fragrance wears out especially if the Dead Animal was not removed. While some commonly recommended home remedies for smell removal may help marginally in some mild smell problems, they are ineffective for Dead Animal smell removal. It’s good to remember that household items such as vinegar, vanilla, charcoal briquettes are not designed to be smell eliminators so the results will often be disappointing and you could lose precious time. Since you will become immune to smell with time, you may think it’s getting better and risk exposure to harmful diseases carried by Dead Animals. You could place your order at NoOdor.com. We do not sell our products in stores. The pouches come with the material already in there so you would only need to purchase the pouch. Where can I get Smelleze. I live in Sarasota, Florida. Our big dog had diarrhea when we weren’t home. He went into a back bedroom and pooped. Turns out, most of it was over the A/C heat vent. Replace of the ductwork would cost thousands. We’ve tried dropping various oils, candle wax into the vent. We currently have one of those mouse repellant sachet packets over the vent. We had our A/C service technicians come and spray what they said will kill absolutely every odor. It’s been a year and nothing is working!!! Any thoughts? Thank you. I would suggest getting our Dead Animal Pouch and placing it on or inside the air vent where the dog made a mess. Where can I buy this product.i live in Wisconsin? We have an awful odor in our lovely home, but are not able to tell exactly the source. Please tell us how to buy your p product so we can get rid of this smell fast! Thank you! Sprinkle your pet with Smelleze® Powder, loosely rubbing into fur. Place pet in an area where dust can be shaken off without causing a mess. Repeat this process the next day if necessary. I would recommend using Smelleze® Reusable Dead Animal Smell Deodorizer Pouches to eliminate the dead animal smell. It will get the odor out even if you have not found and removed the carcass. If you have access to under the home, you can sprinkle our Smelleze Dead Animal Deodorizer Granules and get them as close to the odor as possible. 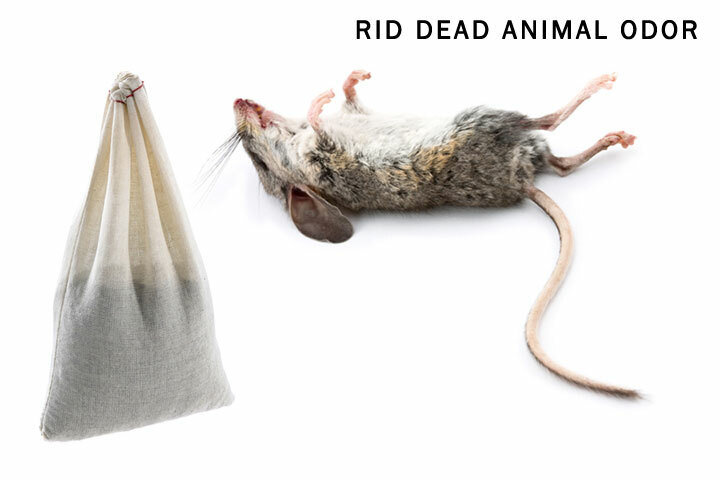 Also, of the odor has filtered into your home, you can use our Smelleze Dead Animal Deodorizer Pouch, X Large. I would suggest using one pouch for every 150 square feet of space that has an odor. I live in a old concrete building in Montreal. Unfortunately I share a kitchen wall with the family across the hall and there are no exhaust fans in the kitchens. The cabinets under my sink smell like garbage and fish funk. When I open my apartment door I can smell the putrid odor from their apartment. They cook ethnic food that smells like urine and had a major roach problem last summer.My kitchen cabinets under my sink started reeking last year so I taped up the crevice where the bottom cabinets meet the wall which happens to be concrete. The smell went away but it is back with a vengeance, I have 3 air sponges in the cabinets but it doesn’t help. When they go out of their back door the odor escapes and comes through my kitchen window it is so nasty! What can I put in my kitchen cabinets to absorb the smell also is their something I can place outside to catch odors? Firstly, you can use Smelleze® Natural Dead Animal Smell Deodorizer Granules to control and stop the dead animal odors on the outside at the source. It can be used anywhere in your yard and crawl space to eliminate the dead animal odors. Smelleze® is extremely easy and safe to use. To apply, simply open the handy sprinkle/pour top on the container and scatter the granules paying special attention to the ‘hot odor zones’ where the carcass is or most likely to be. This product will help even if you have not located the carcass- just scatter generously in the areas that stink! Secondly, I would recommend using Smelleze® Reusable Dead Animal Smell Deodorizer Pouches to eliminate the decaying odor that may have spread into your home. For a breath of fresh air, simply place Smelleze® pouches in all rooms or spaces with the bad odor. If you have a HVAC system, you may also place the Smelleze® pouches on your return air vents, and/or in front of the air return duct in your furnace to filter the odors out faster. Overall, use one pouch for every 150 square feet of area treated and smell the difference. You can use additional pouches for areas with severe odors. We bought a used freezer on Craigslist, when we picked it up, it was turned on and smelled like bleach. We just assumed they cleaned it well for us. Unfortunately, after it warmed to room temperature, we quickly realized that the previous owners were masking a strong dead animal smell or maybe they lost power and a whole lot of raw meat spoiled. Anything we can do? Not even sure it’s salvageable for safe food storage! Yes, I would recommend using our Smelleze™ Natural Dead Animal Odor Removal Granules inside the freezer. I would sprinkle the granules inside and leave it open outside so it can get air flow if possible.